NASA’s Goldstone Solar System Radar, located in California’s Mojave Desert, recently made some detailed observations of asteroid 2010 JL33 on December 11 and 12, 2010 as it tumbled through space at a distance of 5.3 million miles – 22 times further away than the Moon! 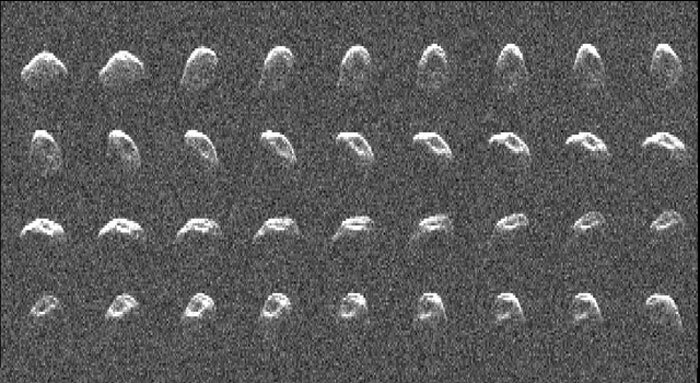 The radar images have also been assembled into a video, which represents nearly one complete rotation of the mile-wide asteroid. Its oval shape and large impact crater are evident in the images…quite an impressive bit of pinpoint imaging from a ground-based observatory, I’d say! Actually the Goldstone radar antenna has imaged asteroids before. Part of NASA’s Deep Space Network of observatories, the Goldstone antenna along with the National Science Foundation’s larger Arecibo antenna in Puerto Rico – the only two such facilities able to image asteroids via radar – have imaged a total of 272 asteroids and 14 comets so far. Read more about asteroid 2010 JL33 and the radar imaging facilities here.